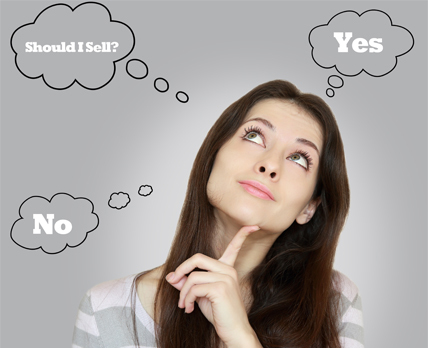 Do you ever find your thoughts going back and forth about whether or not to sell your home? ­As you contemplate your decision, there are many factors to consider, including the current state of the real estate market as well as your lifestyle and financial situation. After years of housing recovery, we are continuing to experience a shortage of inventory among homes for sale in today’s real estate market. Fortunately for you, it’s a total seller’s market right now. According to the National Association of REALTORS®, there was a recent 6.1 percent increase of existing-home sales. This is the highest annual rate since September of 2013. Here are 5 signs it’s time to sell your home. 1. You’re running out of living space. If you’re getting frustrated because you are feeling overcrowded in your home, or if you don’t have enough space for guests to sleep, then you may be ready to sell. Maybe your kids are outgrowing their rooms (literally) or you’re thinking about adding to your family. These are also signs that it’s about that time. 2. You’re not emotionally attached to your home anymore. As you start going through the selling process, things will be a lot more difficult for you and your REALTOR® if you still have some sort of emotional attachment to your home. Being this connected decreases the likelihood that you’ll even want to listen to the real estate agent’s advice. In order to sell, you need to be able to view your house as a product. This is one of most significant factors when it comes to selling your home and moving somewhere else. Are you financially ready to make the leap? Review all costs and expenses related to selling, including moving costs, as well as the down payment and closing costs on your new home. Most importantly, have a game plan. 4. Your equity is a force to be reckoned with. Ever since the housing market crashed, homeowners now have a tendency to be skeptical about putting their home on the market to sell. Thankfully, real estate has come back in full force. Increasing numbers of homeowners are getting their positive equity back and negative equity rates are at their lowest since 2012. Now is the perfect time to see where your equity stands. Do some research and have your home reappraised. 5. You are ready to make your decision. Making the decision to sell your home can be difficult, but you don’t have to do it alone. By partnering with a trustworthy real estate professional, you’ll get the honesty and expert advice that will make the selling process a breeze. By considering all factors and working closely with a pro, you’ll be able to decide what is best for you and your family. So, the choice is yours. Are you ready to list your home?